Cladograms (phylogenetic charts which depict relationships) can be a useful tool for Y-DNA studies of surname groups. Network by Fluxus Engineering is a commonly-used free application for generating cladograms; however, preparation of datasets for processing by Network (often called "Fluxus") can be tedious and error-prone. Enter the Y-DNA utility, which takes "Results" files from Family Tree DNA (in .xml format) and prepares them for processing by Fluxus. 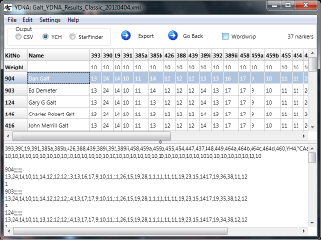 At the most fundamental level, the Y-DNA utility reduces the manual editing process to a handful of mouse clicks. Since Administrators have access to an "Export" option, the easiest way to acquire a data set is to ask the Administrator to download it and send it to you; we suggest using the "Classic" format, since it does not contain computed values (mean, median, mode) that would have to be manually removed. Click on the Open speed button, select the desired "Results" file and click on the Open button. Notice that the Open speed button is then disabled and the Parse speed button is enabled. Click on the Parse button to read the contents of the file into the grid; notice that the Parse button is then disabled, and the Process button is enabled. Choose a row as the reference for processing; the number of columns of data will appear in the speed-button panel on the right. This number will resolve to a larger number during processing, as multi-element alleles are split into separate elements. For example, 30 columns will resolve to 37 markers, 58 to 67, and 102 to 111. Key point: the records processed for export will be determined by the user's choice of reference row: only those records that have the same number of elements or more will be processed. Example: if the user chooses a row with 58 columns, all records consisting of 67 markers or 111 markers will be exported; rows with 12, 24, or 37 markers will be ignored. Click on the Process button; the resulting data is properly formatted for Fluxus. Processing errors and inconsistencies will be identified; typically these are the result of incomplete data (i.e. still pending from FTDNA) or data imported from another source. Click on the Export button to write the data to a file (we suggest saving it on the Desktop). You may now open the file in Fluxus to generate cladograms. For a discussion of more advanced capabilities of the Y-DNA utility, see the User Manual (available for download separately).